Talk About Random! : How to survive a Horror movie! Super Random Topic: How To Survive A HORROR Movie? "Aya, Why are you making such a STUPID post, your just wasting time, instead of uploading all the extra videos you promised?!!" Well you might be right but the videos will be available till later on! No promises. "Why do I need to read this post, If I'm never going to be in a horror movie, plus if I am, I have to do what the script say's, so why make a post???" Very good question! ... Moving on! Here are my tips OR THINGS THAT CHARACTERS IN HORROR MOVIES DO THAT MAKES ME WANT TO PUNCH THEM... enjoy!! If the killer is chasing you, WTH! are you tripping!! I mean I would understand, if you were a clumsy person, and you fell, but even if you were a clumsy person, In that situation I highly doubt anyone would fall. Shoot, you would probably try to trip another person, in order for you to survive! The group would think about the clumsy person as a sacrifice, a kind one, who is willing to help others in order for them to surivive. I know it's mean but still. I mean if you really think about it, most of the time the killer has the biggest disadvantage, with the mask, slow walking, heavy weapons. I mean come on! SURVIVAL OF THE FITTEST!! DON'T RECORD YOUR HOME OR WHEN YOU GO TO SLEEP!! I know we all have seen or heard 'paranormal activity'!! Or some other horror movie that i cannot remember right now... Don't freakin record anything!! If you know something is wrong GTHO!! Or just ignore it! Now if you film yourself while sleeping... either you see something that will scare the heck out of you. Or... you will be watching yourself sleeping and wasting precious valuable time of your life. Attack back! Fight for your Life!! Now this does not apply to all enemies!! I mean come on now, i mean if you are being attacked by something small, that does not have some type of telaphathy powers... kick the darn thing, don't run and hide!!! If you do run, run away from the place, don't just go to some other freakin room!!! Make sure if you win the fight, that it stay dead! Many of us have seen cliffhangers, of the MC, beats down the killer and is about to make it out alive only to realize, the killer was never dead to begin with! So people make sure the job is done. AT THAT MOMENT!!! Don't EVER go back to check if the killer is dead!! Usually he isn't, but I ain't going to go check, if you want to go see go ahead, I'm smart enough to take the chance and run away!!! For some reason, these places are the main source of the problem!! Or they are holding something really creepy that is being locked away! If you find some creepy box, locked away, in a dark corner... LEAVE IT THERE!!! One, stop touching stuff you are not supposed to. Second, why are you even in a creepy place like that in the first place?! I mean seriously most killing always happens in the bathroom. When you close the counter mirror, there is somethin behind you, or when you take a shower, theres something there with you, or when you take a bath, something tries to drown you.... so avoid them! WE ALL KNOW THAT DOES NOT WORK!! !So WHY BOTHER!!! Lastly... DON'T BE DUMB! SERIOUSLY... PHYSICS DOES NOT APPLY IN HORROR MOVIES!! If you litterally see a warning sign saying, don't do this! Dont do it!! Like the Ring, don't watch the video, yet they did... Anyway... if you hear some creepy noise, don't check it out!! Run fool!!! Don't answer the phone... especially when all the creepy stuff is going on! If you see the lights flicker on and off GET OUT!! If you see, the dog or cat, or some animal, acting funny, or looks like its looking at something, LISTEN TO YOUR PET!!! TAKE YOUR PET AND GET OUT!! Yeah fax machine bad news! Which I told Chel to run and dont let the door close!!! I hurried up, then it all went quiet... *Lights went out* stupid phone started ringing in the doctors office, then stopped... lights went back on, by then started rolling up the vacuum, then the intercom started to ring... intercom is not even supposed to work!!! WTBH!! Shoot since it was the last suite we needed to do, we ran out, closed the door locked it, ran, stuffed our supplies, and ran down the stairs, out the front door, when we were driving off, we always look around the building for any lights on, in that particular suite, when we knew the lights were all off, the doctors office was left on. We did not go back, we preffered to get a complain than anything else. Believe me or not is all up to you!! I had, my own personal experience with ghost and whatnot, and its not fun!! So... be smart people and avoid all those situations!! If you are caught, and you know you have a bunch of your close friends inside the building or house. Yell out where you are!! There are better chances of being saved... though there's no guarantee. Real Reason why I made made this post... Recently my bf and I went to a hunted house in Japan during summer break, later on, horror movie topic came up among my group of friends on who would survive a horror movie?... Turns out my bf and I would be the last ones to survive, since they all agree that my bf and I are crazy.... hmmm makes us sound like we really are crazy.... it's a little scary actually, anyway, and i just decided to make a list! If you have anything to add leave a comment down below... if you think I'm crazy and paranoid, well that was always true to begin with, then go ahead and comment, and if you have a topic that you would like us to start make a comment! 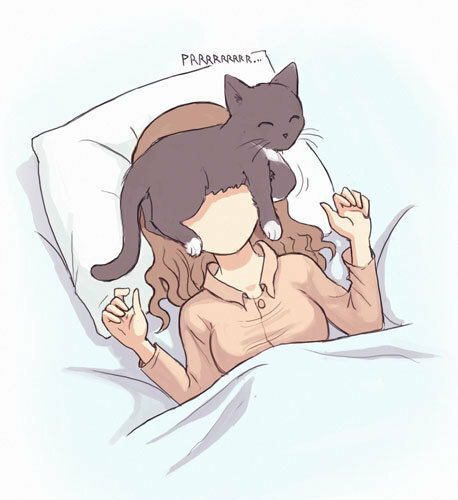 Also, thought this pic is cute, since my cat Polly always does this, Super bad habit of hers!! She's super chubby! Will one day die from suffocation! Now if you really that scared by the pics that I placed, hope this makes you feel better...thought it was cute! where it last picture from? Is it a manga or anime??? I would trip someone to save myself!